The Search and Rescue (SAR) systems course provides pilots a consistent training based on the procedures to be applied during Search and Rescue (SAR) missions on a helicopter equipped with SAR optional equipment, SAR AFCS upper modes and FMS. Note: This course may be combined with our Hoist Operator training – Type conversion. Note: This training is customized according to aircraft configuration and equipped devices. Please refer to the relevant syllabus to have more details on instructional flight. The Mountain Training course provides knowledge and proficiency to operate aircraft safely and efficiency during mountain operations. Note: For more information on instructional flight, initial or advanced training, please refer to the course syllabus. The Firefighting Operations course provides knowledge on fire behavior and air operations (including water bombing operations) for helicopter pilots. The theoretical instruction can be performed within the French Firefighting Training Academy. 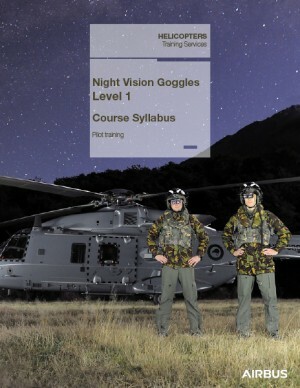 Conversion to type NVG: This training enables the pilot to take advantage of a new aircraft type when flying with NVG. This training has to be performed after type rating and maturity phase. 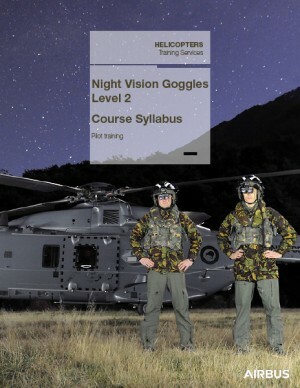 The adequate NVG training areas must be made available. A site survey has to be completed by our flight operation department in order to authorize flight instruction. The Maintenance Check Pilot course provides skills and proficiency to perform all checks described in the Section 8 of the flight Manual.